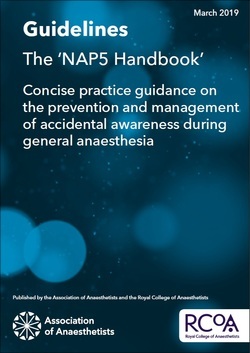 'The NAP5 Handbook - concise practice guidance on the prevention and management of accidental awareness during general anaesthesia' is being published in response to the 2014 fifth National Audit Project (NAP5) of the Royal College of Anaesthetists and Association of Anaesthetists. This was the largest ever study to date looking at accidental awareness during general anaesthesia (AAGA) in the UK and Ireland. Professor Ravi Mahajan, President of the Royal College of Anaesthetists said: "The NAP5 Handbook now provides, for the first time, anaesthetists and other clinicians with an easy-to-use reference guide which they can use to advise and consent patients undergoing general anaesthesia for surgical procedures. I know that accidental awareness can be a concern for some patients, so for anaesthetists to have this handbook available to reassure their patients, is a welcome step forward." Association of Anaesthetists president and consultant anaesthetist at Aberdeen Royal Infirmary, Dr Kathleen Ferguson, said: "Although the majority of the three million general anaesthetics administered every year in the UK and Ireland are uneventful, any medical procedure always carries a risk of complication. Whilst AAGA can't be completely eradicated, by increasing our understanding of why it happens and improving professional practice we can reduce the risk to patients. 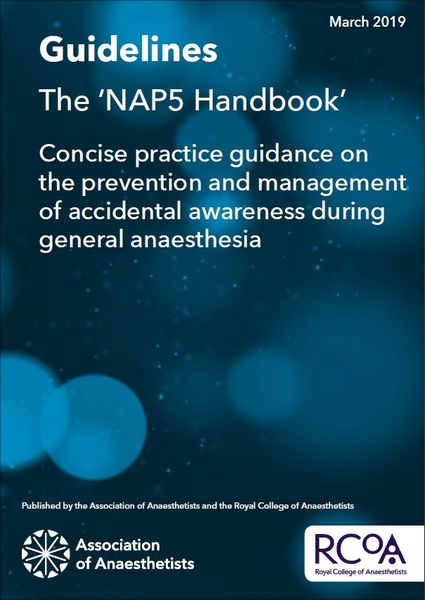 "The NAP5 Handbook provides easily accessible actions and guidance for practitioners to help prevent and manage accidental awareness during general anaesthesia. By making it available to all anaesthetists, clinical and medical directors of hospitals and health service management throughout the UK and Ireland we aim to ensure all practitioners can access this important guidance."